This ’71 Chevelle is part of the family. 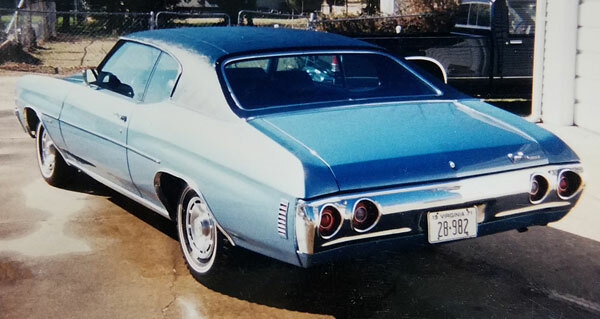 In 1968 I bought a ’68 Chevelle SS396 as a family car. My Dad liked the 112” wheelbase for ease of parking. He had never owned a new car before and said he would like to buy one in the spring. Unfortunately he passed away in January, 1971. He was going to buy a new Chevelle. Mom decided to go through with the purchase in April of ’71. 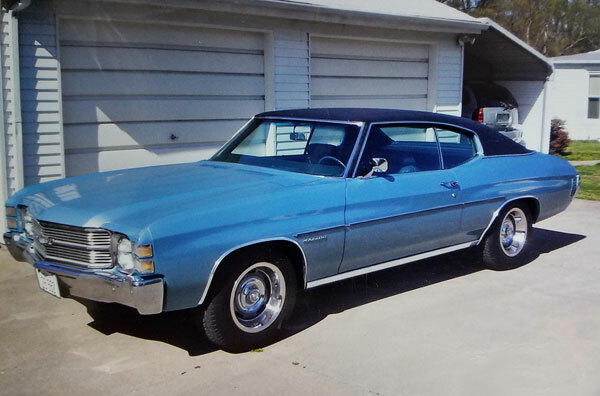 She said “I want a blue car with a vinyl top.” At that time, I worked at a Chevy dealer and pulled two blue Chevelles out of stock for her to decide on. She picked the one with the cloth interior. The car was billed out to me as an employee, for a $100 over cost discount. Mom’s new car was a Malibu. 307 Turbo transmission, power steering, factory air conditioning, AM radio, whitewall tires, full wheel covers and deluxe seat belts. She really enjoyed the power steering because her ’62 was manual steering. In 1981, Mom said she wanted somewhere to put her car, in with her lawnmower and yard tools, so we went together and built a 2 car garage. So now I had someplace to park my ’55 Two-Ten. Every time Mom went out, she put the Malibu back in the garage when she returned home. I got to service the car and many times the battery would be dead when I went to visit her. She would leave the door open after getting things out of the car. Quick fix: remove the dome light bulb – no more dead battery! Mom drove the Chevelle 61,000 miles, until she was 87 years old. We advised her not to drive any longer because her car didn’t have power brakes. She replied, “OK, as long as y’all take me where I want to go.” With her 4 children that lived in town, that was no problem. I was the only one that would take her in the Chevelle though. I went back home in 1995 to live with her and was there most weekends. Sadly, Mom passed in January of 2001, exactly 30 years after my Dad. I bought my siblings out and I still live in that house today – the house I was born in. When it came to settling her affairs, I bought the Chevelle and some of her furniture. It was necessary to repaint the Chevelle in the early ’80s because the car had sat outside for 10 years and the paint had faded. It has the original engine, transmission, and spare tire. I had the vinyl top replaced, as well as the carpet. I replaced the tires and wheels with 8” Rallys and added a dual exhaust system. About 3 years ago I installed an Edelbrock 4 bbl carb and a GM HEI ignition. That brought the 307 to life! 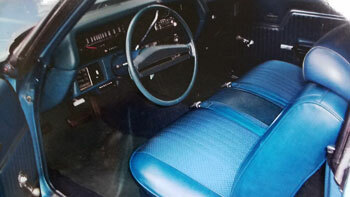 The Chevelle received 984 points at the Winter National in 2004 and 944 at the 2010 Nashville show. It now shows 71,000 miles and runs better each time I drive it. It’s a keeper! I also own a ’55 Bel Air Sedan and a ’57 Bel Air hardtop – the ’57 is also a keeper – it was my son’s first car. He restored it when he was 15 years old. He’s 54 now.